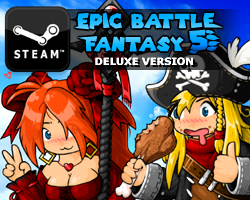 Hey guys, I’ve update the free version of Epic Battle Fantasy 5 on my website. This means that that version is up to date and “finished” now. Not sure when it will come to other websites, but for now you can play it there, and there’s been a lot of changes since it was in beta. I’ve also updated the game on Steam, going right from version 1.2 to 1.5, so there’s a lot of things that can go wrong, especially with the new saving system. Just so everyone knows: You have the option to stay on the old version if you wish. It might be worth a try if you encounter any major problems. 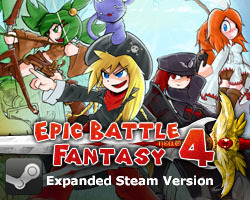 You can go to Steam Client > EBF5 > Right Click > Properties > Betas > Select version 1.2. This entry was posted in Epic Battle Fantasy 5 on January 26, 2019 by Matt Roszak. Thanks man, you’re a lifesaver. Been waiting for a while, you’re a great dev, good job! Can you try possibly rebranding or updating the battle demo sometime? Anyone else has the problem where they can’t save the game? The save slots just stay empty/whatever was there before. Some time ago I loaded my lvl 18 save, grinded all the way up to 25 or so, only to notice that the next time I opened the game, my autosave is still at lvl 18. Moreover, if I open the game on incognito mode, saving works correctly. But I would prefer them to work during normal browsing too, in case I forget to make a backup and lose my progress. Have you guys had similar problems? Any idea how to fix it? Could be an ad blocker doing that.